What's to be said about this book that hasn't already been said? 'Ghost' was published in the US back in 2016 but UK-based publishing house Knights Of have brought it to these shores, opening it up to a whole new audience. It has garnered multiple rave reviews and mine won't be anything different. This is not just a book about sports, although it sure will appeal to sports fans. For Ghost running is a way of life. He starts off running when his dad tries to shoot him and his mum (parental discretion advised - this isn't revealed at first) but when a running coach eventually notices his speed and ability, running becomes something so much more: it becomes a motivation to attempt to curb his bad behaviour at school; a distraction from the torments of a young, troubled life. 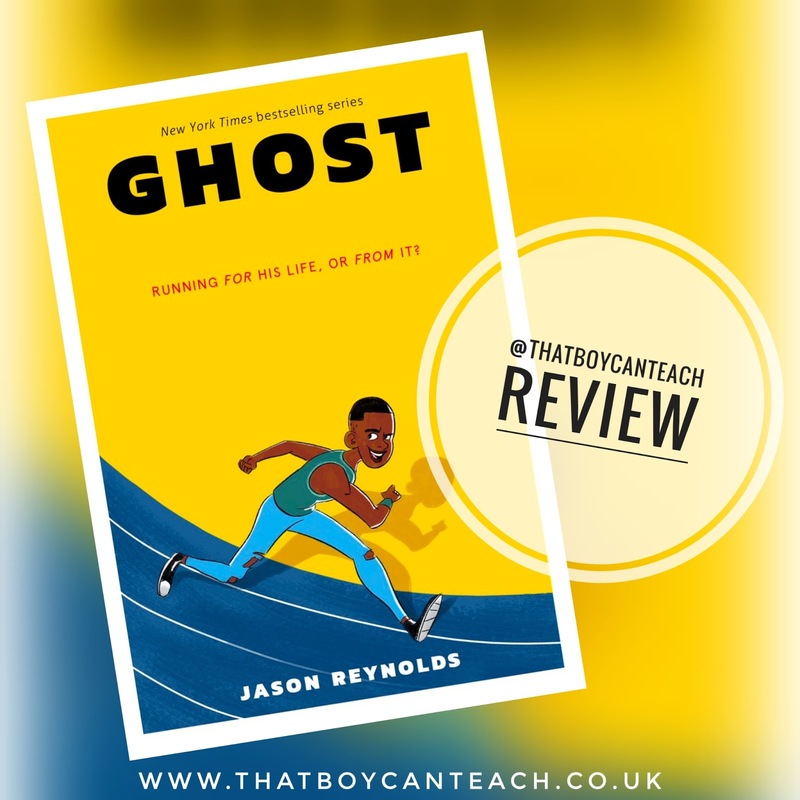 In Jason Reynold's portrayal of Castle Cranshaw (that's Ghost's real name) we see an impassioned plea for understanding and acceptance; a cry for the world to empathise with those whose life circumstances might translate into misbehaviour. Ghost's mum is great, so's his auntie. And coach really goes the extra mile in his attempts to better Ghost, both as an athlete and as a person, but Ghost's past still haunts him. This book gives just one possible back story, allowing the reader to see life through the eyes of someone less fortunate. Alternatively, in the right hands, this could be the book that inspires a young person to really persevere, work hard and to nurture their talents and pursue their interests. This story is a great testament (albeit fictional) to the power of sports, hobbies and interests in providing a path to greater things when other doors appear to be closed. This is an uplifting read, told with great humour from the point of view of a streetwise boy somewhere in an American city. The diverse cast of characters sprint off the page leaving the reader feeling like they know all of them, even the more minor players. Castle, even to someone who knows no one like him, is so convincingly real: he's the sunflower seed-sucking, world record obsessed, wise-cracking friend that you never had - a loveable rogue whose story you just have to follow. Although there are some references to domestic violence, I'm not sure I'd have an issue with mature upper key stage two children reading this book. Perhaps reading it with an adult would be preferable, but then there are probably children out there who can relate to these issues for whom this would be a salve rather than a shock. Having said that, reluctant secondary-age readers would welcome the fact that an accessible writing style has been paired with more mature themes, as well as humour - this really is the type of book that could hook someone into reading for the first time.